​Wallpapers to make Dock invisible. Light color backgrounds for XS/X. Keep OFF Reduce Motion in setting. The iOS Dock changes it based on the background color. These wallpapers make the color of Dock so that it will be almost the same color as the background as a result of its color change. In X, neither the shape of Dock nor how to pick up color is linear, so the color of the band for that is not homogeneous. ​Precise positioning is required for this trick. 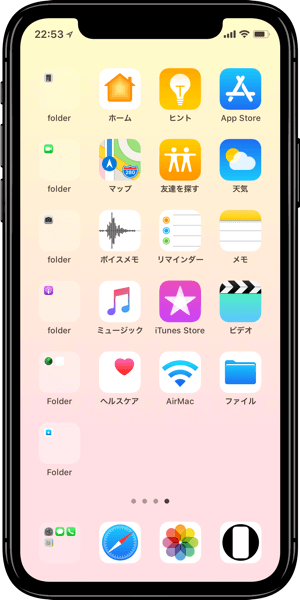 On iPhone X, even if you attempt to display the entire screen size wallpaper with pinch in, the image is deformed to portrait and the position is not fixed. (It seems likely to be possible on the setting screen). Even if you turn on "Reduce Motion" it is the same. If you use "Reduce Motion", please turn it off only in setting.Also, if you tap "Perspective", the wallpaper moves up, and then select "Still" the position will not be restored. If you move the wallpaper, you must cancel the selection once and start over from the beginning.